Imagine what your hands would feel like if you permanently wore thick leather gloves lined with cotton wool, this is what your feet feel like everyday; desensitised! I recently came across a research article on how the choice of training shoes affects the way you run, especially in older adults. The article was entitled “The effect of training shoes on running kinematics in older runners”. This spurred me onto writing this article, to share with you my experience and knowledge on the subject and to hopefully help to prevent and avoid any injuries you may have. Many of you will be aware of the ‘new’ movement towards wearing minimalist running shoes to improve running performance and prevent injury. This natural way of running, designed by evolution, avoiding over-padded/over-marketed footwear has many benefits but it is crucial to adapt to it gradually to avoid transitioning injuries, especially for the older runner – like me! Manual medicine specialists have for decades recommended going barefoot. Lewit (2008) suggests constant use of footwear results in sensory deprivation for the foot, reducing reflexive foot intrinsic and extrinsic muscle activation, and ultimately causing foot/ankle deconditioning. This is supported by experimental research (Nurse and Nigg, 2001). To cut a long story short, our feet are full of sensory receptors and need sensory stimulation for our foot muscles to function properly, something we are lacking by wearing shoes all of the time. 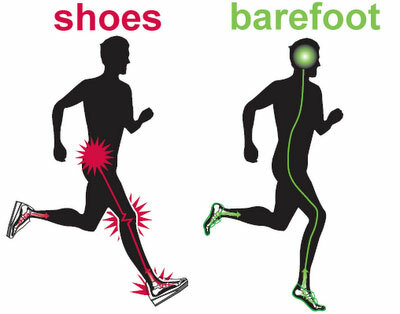 Muscle activity maintains the normal shape of our foot arches and controls effects of pronation (Headlee, 2008). 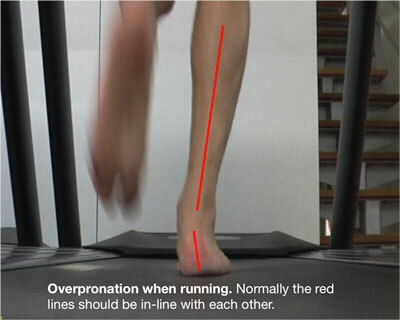 Overpronation can lead to a lot of short and long-term injuries such as ankle sprains, knee injuries, and back pain; your arches are there to buffer the forces that your body is subjected to when walking and running. 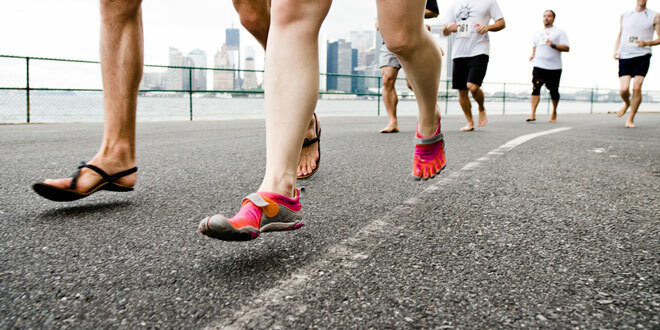 Totally barefoot, or Vibram 5 fingers footwear, is also not advisable for most people, nor is excessive running on unnatural hard surfaces (concrete/tarmac). Vibram 5 fingers are also very expensive, and the same results can be achieved with a cheap minimalist shoe such as a plimsole shoe, canvas shoe, or Converse shoe. 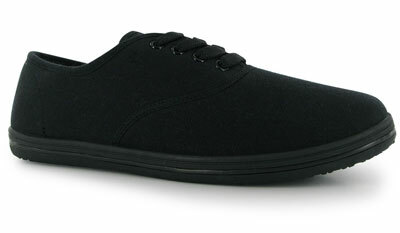 Note: if you have wide feet, a Converse shoe is not recommended as they are a narrow build of shoe. Park runs are ideal, running as much as possible on grass i.e. cross country. If you are lucky to live near a beach, walking and running on sand is recommended to re-stimulate your foot muscles but only over short distances. 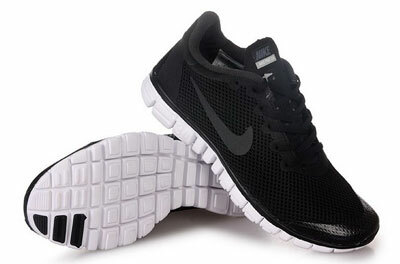 My personal approach has been to use Nike Free 3.0 and/or the more minimalist ‘plimsole’ such as Slazenger Canvas shoes from Sports Direct (mens) or (womens) (£ 4.50/pair). Remember to do short runs at first to condition (stretch and strengthen) your muscles, tendons, ligaments and joints – running increases loads by up to 2.5 to 3 times more than your bodyweight! Athletes who heel strike upon initial contact with the ground have a higher initial peak load than midfoot strikers (Brotzman 2011). For a runner who has a heel strike, these forces transmit directly through the heel and does not engage your body’s natural shock-absorbing mechanisms such as your muscles (quadriceps, calf muscles, and other muscles in your legs). Also it is very important to re-think your running style to improve efficiency and reduce impact. 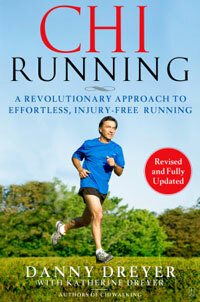 I strongly recommend Chi Running by Danny Dreyer which is thoughtfully written for any runner, from short park runs to ultra-marathons. 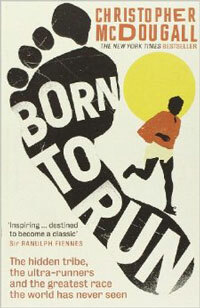 And for those looking to develop a love of running, and a great story too, take a look at Born to Run by Christopher McDougall. The following Abstract by the American Academy of Orhopaedic Surgeons – “The Effect of Training Shoes on Running Kinematics in Older Runners” strikes a word of caution to those used to running (and walking) in heeled shoes. Remember though that many injuries, especially to knees are caused precisely because of wearing over-padded/over-marketed/over-priced heeled running shoes. They can cause an unnatural heel running style and overpronation of the foot. They reduce the message sent from the feet to the rest of the body on impact, particularly to the knees which don’t know whats coming and are overloaded. In most instances its ‘never too late to change‘ and to re-learn natural movement patterns and running becomes a lot more fun. INTRODUCTION: Recently there has been enthusiasm for minimalist shoes or barefoot running to create a more natural running style featuring forefoot strike as opposed to heel strike typically seen in the large heeled training shoes. A previous study looking at elite competitive adolescent runners showed that these athletes changed from a heel strike pattern to a forefoot strike immediately upon transitioning from the large heel trainer to either a track flat or barefoot running condition.1 It is unknown whether more experienced runners would exhibit this same quick change in running pattern with change in shoe condition. METHODS: Twenty-six runners of greater than 10 years running experience and all over the age of 30, were tested upon a treadmill with various speeds. Shoe heel-to-toe drop was measured using a digital caliper. They ran in both their normal running shoe and in the barefoot condition. Additionally, their running shoe was measured with respect to the height of the heel versus forefoot thickness. Running speeds of 6, 7 and 8 mph were used for the women and 7, 8 and 9 mph were used for the men. A motion capture system was utilized to analyze foot strikes by a single blinded examiner skilled in the use of the camera system and running mechanics. Statistical analysis was performed. RESULTS: Heel-to-toe thickness of the running shoe did not significantly correlate with percent heel strike either in the shoe or barefoot conditions. Alterations in speed also did not change foot strike pattern. 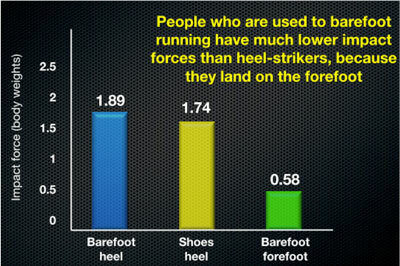 Running barefoot resulted in a significant drop in percent heel strike at all shared speeds (p-values < 0.001 ). However, 40% of the men and 20% of the women persisted with consistent strike patterns across all speeds with and without shoes. DISCUSSION AND CONCLUSION: A forefoot strike has potential advantages, but recent reports indicate a high injury rate as athletes adopt a barefoot or minimalist running shoe condition.2. Alteration in foot strike pattern does not always occur immediately when older experienced athletes go from a training shoe to the barefoot running condition, in contrast to adolescent runners. Some of these runners persist with a heel strike even when barefoot and at high speeds. These more mature runners may have a much more established gait and a longer period of time may be needed to accustom to a forefoot strike with a barefoot running condition or minimalist shoe. This may lead to frequent injuries in individuals who attempt to either run barefoot or with minimalist shoes, but persist with the heel strike pattern. Older runners should be cautious when beginning a barefoot or minimalist shoe running regimen and might consider an assessment of their foot strike pattern. References:1. Mullen S, Toby EB. Adolescent runners: The effect of training shoes on running kimenatics. J Pediatr Orthop 2013; 33(4):453-457. 2. Ridge ST, Johnson AW, Mitchell UH, Hunter I, Robinson E, Rich BSE, Brown, SD. Foot bone marrow edema after a 10-wk transition to minimalist running shoes. Med & Sci in Sports & Exercise 2013; 45(7):1363-1368. When transitioning from wearing trainers with a large heel to flat trainers: take your time, take at least 8 weeks to transition, initially wear the minimalist shoe at the start of a run and swap over to your old shoes, slowly gradually introduce your new shoes bit by bit (10 percent more each week), listen to how your feet are responding, take your time. Most running injuries are a simple case of “too much, too soon”, which can be avoided by gentle transitions in difficulty. Allow yourself time to rest and recover, as “over-use” injuries are often due to under-recovering, allow your body time to adapt and heal, as each training session sends a message to your body to grow stronger but it needs time to do this. For those science boffs out there, most running injuries can be put down to a simple statement of “Injuries occur when the rate of application of training stimulus exceeds the rate of recovery and adaptation”. Be sure to read our previous Blog post entitled “Ready to Run” to find more information on preparing yourself to run again and minimise common runner’s injuries. Brotzman, S. Brent, Robert C. Manske, and Kay Daugherty. Clinical orthopaedic rehabilitation: an evidence-based approach. Elsevier Health Sciences, 2011. ?Headlee et al. Fatigue of the plantar intrinsic muscles increases navicular drop. Journal of Electromyography and Kinesiology, 2008;18(3):420-425. ?Nurse MA, Nigg BM. The effect of changes in foot sensation on plantar pressure and muscle activity. Clinical Biomechanics, 2001;16(9):719-727.